At at time when whether the choice of kneeling or standing has come under Presidential scrutiny, it is a good idea to look back at our Pledge of Allegiance’s history. 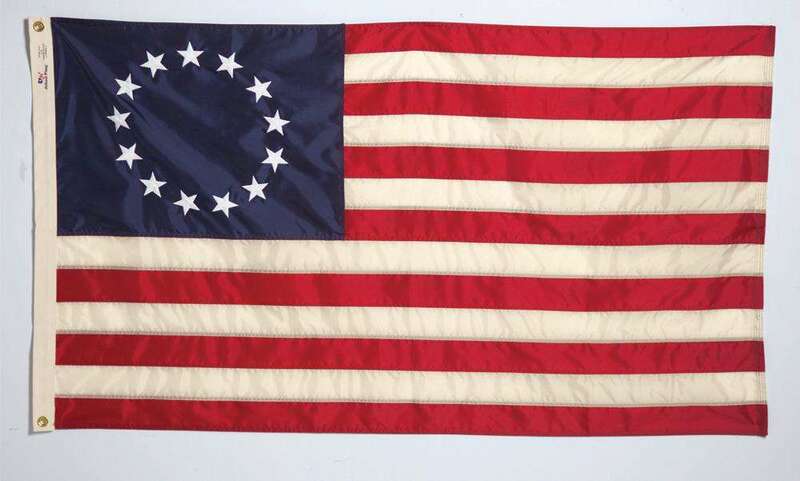 It might seem that we’ve always had one, but like most social icons, the United States had no allegiance to the flag for more than a century and we’ve only had a government sanctioned one for less than a century. Here’s some of that timeline. October 12, 1892: during Columbus Day observances organized to coincide with the opening of the World’s Columbian Exposition in Chicago, Illinois, the pledge of allegiance was recited for the first time. Francis Bellamy [Smithsonian article], a Christian Socialist, had initiated the movement for such a statement and having flags in all classrooms. His pledge was: I pledge allegiance to my Flag and the Republic for which it stands, one nation indivisible, with liberty and justice for all. In 1923: the called for the words “my Flag” to be changed to “the Flag of the United States,” so that new immigrants would not confuse loyalties between their birth countries and the United States. The words “of America” were added a year later. May 3, 1937: as the rest of the world headed toward World War II, a patriot fervor swept the U.S., as it had before, during and after World War I. One expression of that movement involved state laws requiring public school students to salute the flag each morning. The Jehovah’s Witnesses, however, regarded saluting the flag as an expression of a commitment to a secular authority and unfaithfulness to God. As a result, some families had their children refuse to participate in the compulsory salute. On this day, Walter Gobitas (the family name was misspelled in the court case) sued the Minersville, Pennsylvania, School Board, in a case that ended up in the Supreme Court: Minersville School District v. Gobitis. June 3, 1940: Minersville School District v. Gobitis, was a decision by the US Supreme Court involving the religious rights of public school students under the First Amendment to the US Constitution. 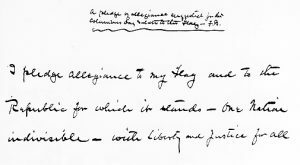 June 22, 1942: the US Congress officially recognized the Pledge for the first time [Gilder Lehrman Institute article] , in the following form: I pledge allegiance to the flag of the United States of America, and to the Republic for which it stands, one Nation indivisible, with liberty and justice for all. 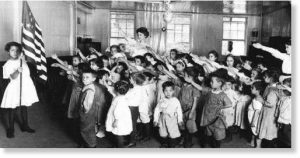 During the 1920s and 1930s, Italian fascists and Nazis adopted salutes which were similar in form, resulting in controversy over the use of the Bellamy salute in the United States. December 22, 1942: Congress amended the Flag code to replace the Bellamy salute with the the hand-over-heart salute. The Bellamy salute had been the salute described by Francis Bellamy to accompany the American Pledge of Allegiance, which he had authored. 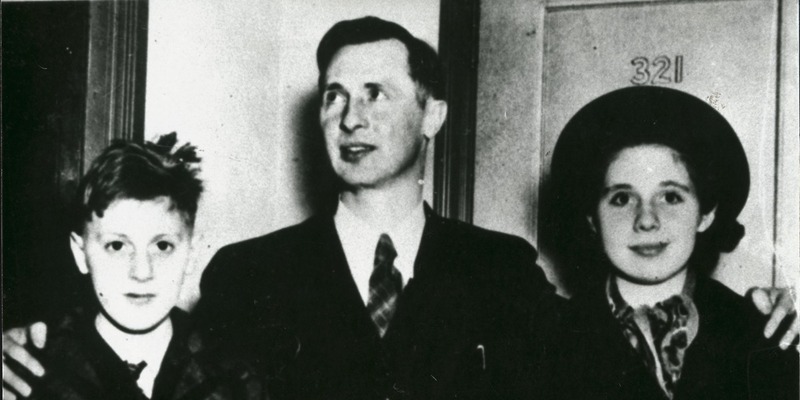 June 14, 1943: West Virginia State Board of Education v. Barnette, the US Supreme Court held that the Free Speech Clause of the First Amendment to the Constitution protected students from being forced to salute the American flag and say the Pledge of Allegiance in school. It was a significant court victory won by Jehovah’s Witnesses, whose religion forbade them from saluting or pledging to symbols, including symbols of political institutions. However, the Court did not address the effect the compelled salutation and recital ruling had upon their particular religious beliefs, but instead ruled that the state did not have the power to compel speech in that manner for anyone. Over the next two years, the idea spread throughout Knights of Columbus organizations nationwide. August 21, 1952: the Supreme Council of the Knights of Columbus at its annual meeting adopted a resolution urging that the change be made universal and copies of this resolution were sent to the President, the Vice President (as Presiding Officer of the Senate) and the Speaker of the House of Representatives. 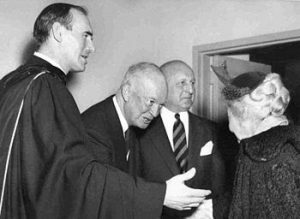 February 1, 1953: President Eisenhower was baptized, confirmed, and became a communicant in the Presbyterian church in a single ceremony. It had become a tradition that some American presidents honored Lincoln’s birthday by attending services at the church Lincoln attended in Washington, DC, [the New York Avenue Presbyterian Church] and sitting in Lincoln’s pew on the Sunday nearest February 12. 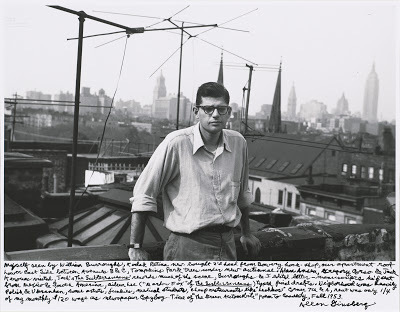 He argued that the nation’s might lay not in arms but its spirit and higher purpose. 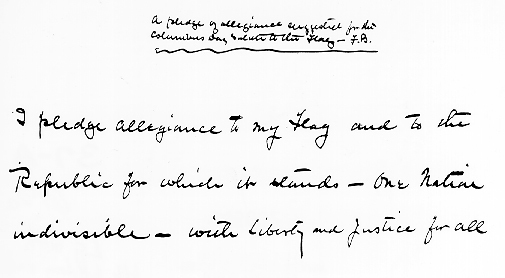 He noted that the Pledge’s sentiments could be those of any nation, that “there was something missing in the pledge, and that which was missing was the characteristic and definitive factor in the American way of life.” He cited Lincoln’s words “under God” as defining words that set the United States apart from other nations. February 8, 1954: Eisenhower acted on Rev Doucherty’s suggestion and Rep. Charles Oakman (R-Mich.), introduced a bill to that effect. March 4, 1969: the New York City Corporation Council upheld the petition of Dorothy Lynn, a 17-year-old Queens, NY high school student to leave her classroom during the Pledge of Allegiance. October 31, 1969: Mary Frain and Susan Keller, two 12-year-old 7th grade girls in Brooklyn went to court to assert their right to remain seated in class while other students recited the Pledge of Allegiance. New York Civil Liberties Union lawyers represented the girls. The NYCLU cited the Supreme Court case of West Virginia v. Barnette, decided of June 14, 1943, in which the Court upheld the right of Jehovah’s Witness’s children not to salute the American flag as required by their school. On December 10, Judge Orrin G Judd, enjoined the city school system from telling student that they must leave the classrooms if they do not want to stand and recite the Pledge. Judge H. Curtis Meanor ruled that the standing mandated by the State Education Law illegally compelled “symbolic speech” and violated students’ First Amendment rights of freedom of expression and speech. 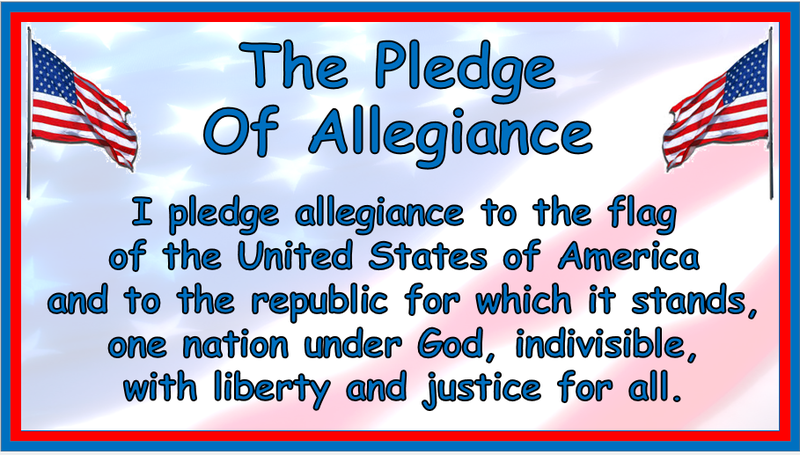 The New Jersey statute stipulated that the pledge be recited and a flag salute rendered by all children in public schools, except for the children of foreign diplomats or for youngsters with “conscientious scruples” against the acts. But the law required that the exempt pupils “be required to show full respect to the flag while the pledge is being given merely by standing at attention.” Judge Meanor objected to the “mandatory language” of that section of the law. Under or not under God? A three-member panel of the United States Court of Appeals for the Ninth Circuit ruled that the pledge, as it exists in federal law, could not be recited in schools because it violates the First Amendment’s prohibition against a state endorsement of religion. 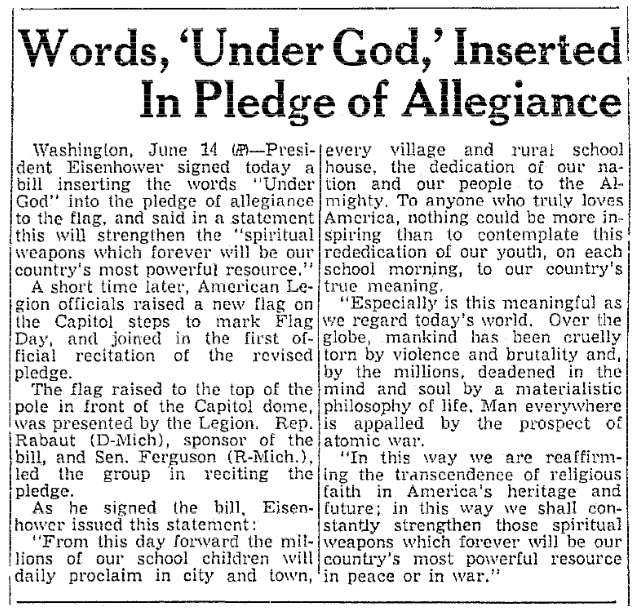 In addition, the ruling turned on the phrase ”under God” which Congress added in 1954 to one of the most hallowed patriotic traditions in the nation. August 9, 2002: the U.S. Justice Department filed an appeal of the Ninth Circuit Court of Appeals’ ruling in the Newdow vs. U.S. Congress case in which the court struck down the addition of the phrase “under God” to the Pledge of Allegiance as unconstitutional. February 28, 2003: the 9th U.S. Circuit Court of Appeals, which ruled that the addition of “under God” to the The Pledge of Allegiance was unconstitutional, refused to reconsider its ruling, saying it would be wrong to allow public outrage to influence its decisions. March 4, 2003: the US Senate voted 94-0 that it “strongly” disapproved of the 9th Circuit Court of Appeals decision not to reconsider its ruling that the addition of the phase “under God” to the The Pledge of Allegiance was unconstitutional. 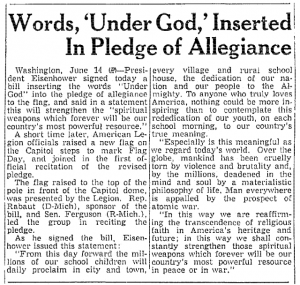 April 30, 2003: the Bush administration appealed to the Supreme Court to preserve the phrase “under God” in the The Pledge of Allegiance recited by school children. Solicitor General Theodore Olson said that “Whatever else the (Constitution’s) establishment clause may prohibit, this court’s precedents make clear that it does not forbid the government from officially acknowledging the religious heritage, foundation and character of this nation,” and that the Court could strike down the 9th U.S. Circuit Court of Appeals ruling in Newdow vs. United States without even bothering to hear arguments. October 7, 2017: a federal lawsuit charged that Windfern High School suspended India Landry, a 17-year-old Houston student, after refusing to stand for the daily Pledge of Allegiance. Landry said that she had sat for the Pledge hundreds of times at Windfern High School without incident,however, Principal Martha Strother removed her after Landry declined to stand for the Pledge. 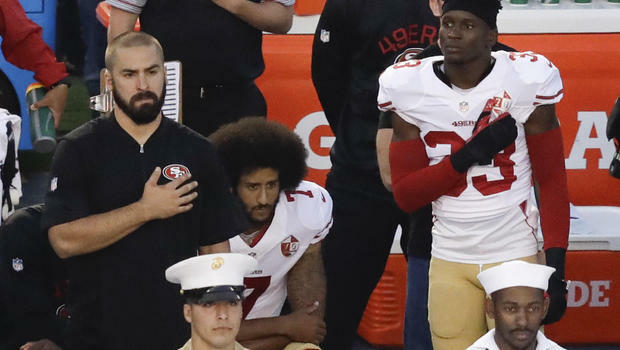 According to the lawsuit, school administrators had “recently been whipped into a frenzy” by the controversy caused by NFL players kneeling for the national anthem. Washington Post article on the Pledge’s history. On September 29, 1972, the State Supreme Court of New Hampshire issued a decision in the case of State v Hoskin. It concerned two drivers. 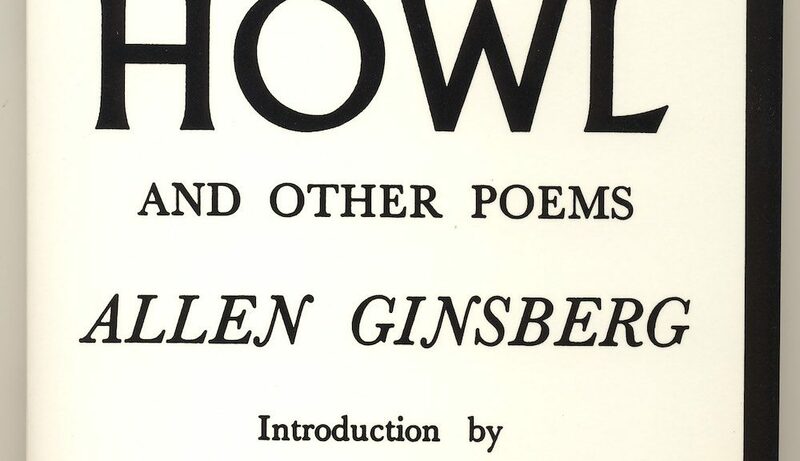 One “Hoskin hammered out and painted over in white paint the words “Live Free or Die” upon 1971 automobile registration plates issued to him, and that [another] the defendant Ely placed tape over the same words, upon 1971 plates issued to her. Ely and Hoskin said they were expressing free speech under the first amendment. The State Supreme court ruled otherwise. It said in part, “Obliteration of the motto tends to defeat the establishment of a uniform number plate system, and is analogous to the offense of mutilation of national coins or currency by obliteration of the national motto, “In God We Trust”. George Maynard was a a Korean War veteran and worked as a printer in Vermont. He and his wife Maxine lived in New Hampshire. 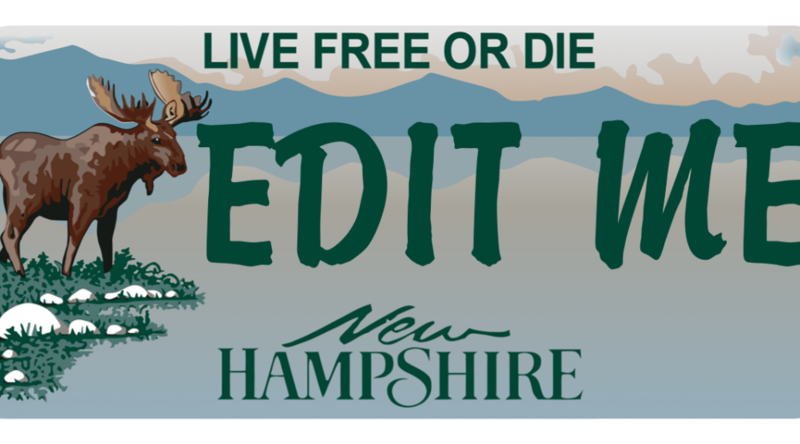 They were both Jehovah’s Witnesses and viewed the motto on the New Hampshire license plate the motto violated their religious beliefs because it implied that one had to give up his life for the state. To Maynard and Maxine, the only kingdom was God’s kingdom and for this reason they covered up the motto on the license plates of their jointly owned family automobiles. On November 27, 1974, police issued Maynard a citation for violating the state statutes regarding obscuring of the state motto. On December 6, 1974 George Maynard appeared in Lebanon District Court (NH) to answer the charge. After waiving his right to counsel, he entered a plea of not guilty and proceeded to explain his religious objections to the motto. 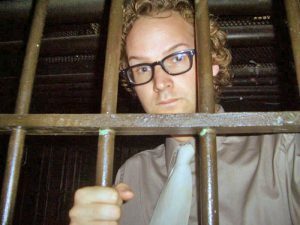 The state trial judge expressed sympathy for Maynard’s situation, but considered himself bound by the authority of State v. Hoskin to hold Maynard guilty. The judge fined Maynard $25 but suspended it during “good behavior.” On December 28, 1974, police again charged Maynard was again charged with violating the license plate statute. On January 31, 1975 a judge fined him $50 and sentenced him to six months in prison. 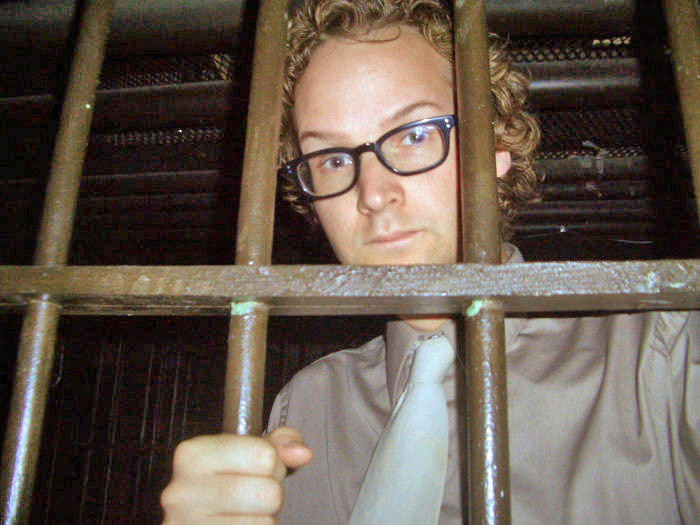 The judge then suspended the sentence provided that Maynard pay his fines. Maynard told the judge that as a matter of conscience he would not pay them. The judge then made him serve 15 days in jail. Before appearing in court for the second charge, Maynard had received a third citation but received no additional penalty. The Maynards would not stop obscuring the plate and feared additional fines and jail. At the urging of the American Civil Liberties Union, the Maynards sued in the United States District Court for the District of New Hampshire. They sued Neal Wooley, the chief of police in Lebanon, N.H., and the state, alleging a violation of their First Amendment rights. American Civil Union Attorney Richard S. Kohn and New Hampshire attorney Jack Middleton represented the Maynards. A week later, on March 11, 1975 a federal judge issued a temporary restraining order, preventing further arrests and prosecutions of the Maynards. The case then proceeded to a panel of three federal judges at the district court level. Kohn and Middleton had also pointed out that State vehicle license plates did not carry the motto. New Hampshire Governor Meldrim W. Thompson ordered the state attorney general David Souter to take the case to the U.S. Supreme Court. Souter is now a sitting Supreme Court justice. On April 20, 1977, the Supreme Court voted 6-3 in favor of the Maynards. The Supreme Court likened the Maynards’ refusal to accept the state motto with the Jehovah’s Witness children refusing to salute the American flag in public school in the1943 decision, West Virginia Board of Education v. Barnette. In that case the court had ruled that the state had violated the First Amendment by punishing students and their parents for the students’ refusal to salute the flag and recite the Pledge of Allegiance. “We begin with the proposition that the right of freedom of thought protected by the First Amendment against state action includes both the right to speak freely and the right to refrain from speaking at all,” Chief Justice Warren Burger wrote for the majority in Maynard. The Maynards received no compensation for their victory. The federal district court awarded $21, 000 in fees to Kohn and Middleton, who were working pro bono for the Maynards. The State refused to pay and the lawyers had to get a US Marshall to collect from the State. The Maynards moved from New Hampshire to Connecticut. There an officer cited them for covering up the “The Constitution State” on their car’s plate. After the Maynards called their lawyer the they heard no more about the citation.